Discussion in 'iPhone Accessories' started by Sal09, Sep 22, 2014. Seriously thinking of ordering one of these for my IPhone 6 Gold. That'll be very helpful .. Looking forward to the pics .. I've used them before for my iPad Air sleeves .. Can't fault them tiny bit. How much was it with shipping? Really doubted between the grey/red and the limited green. Am I crazy or, how come i cant find a way to add that to a cart or something, looks incredibly sharp looking. Nice post OP. Thanks! As I get older the attention span and eye sight is decreasing, lol. Thanks for the help! Love it, fits like a glove! I think the brown inside would match the gold iPhone even better. WOW .. It is a thing of beauty .. im trying to get sleeve customised just like they do it for ipad + smart case. Iphone + brown case to fit in that sleeve. Nice. I have been looking all over for a nice looking sleve for the iPhone 6, but no luck until now. Only thing is, i was looking for one with a strap, to pull out the phone (like the Puro slim essential sleeves). You say the phone and sleeve has a nice fit, but how easy is it to get the phone out of the sleeve ? Some sleeves for iphone 5 was ridiculously tight, and it was impossible to get the phone out in a hurry. Is it the same for the Joli Originals ? Didn't order a limited edition, but brown with pink felt to match my others. Wish I'd paid for FedEx. Waiting on the Post Office. You just push up from the base. Very soft leather!!! Ok. Good to know. Do you thing it is the same with the " textured" and "smooth" collection ? But if it is very soft leather, will it then give any protection if the phone is droppet. Or the true purpose of the sleeve is probably more for eliminating pocket scratches? I'd say more for avoiding scratches but there is some protection for the corners. I wouldn't rely on it in tough situations. I'm ordering a Lifeproof for that scenario. They are so beautiful. I have had the smooth and the textured leather and they are both great but prefer the smooth. They are both very soft. It's not an otterbox, but I think the edge can protect the corners quite well. But I'm not going to test it! Ha, yeah that's the worst part, doubted a very long for mine, I have a space grey iPad and have a smooth-grey with red sleeve for that, looks really nice. Could you post a picture of your iPad with the grey/red sleeve ? Man that looks beautiful. I just wish I felt comfortable using the thing without a case, it just feels so fragile and slippery. 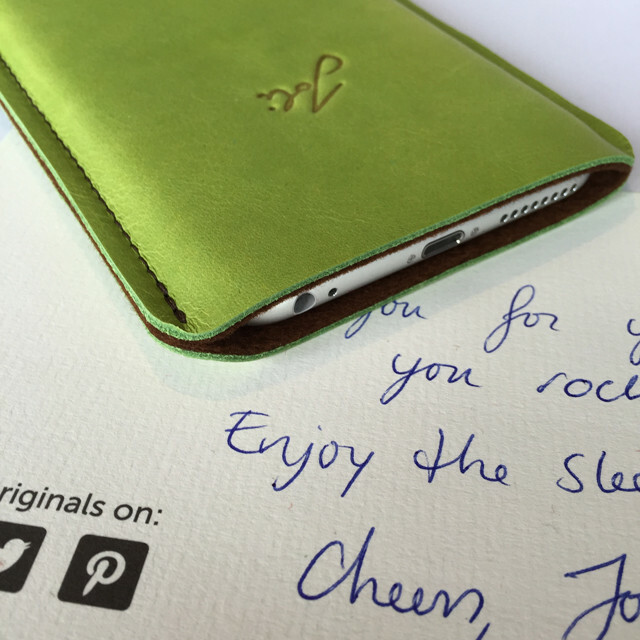 Alongside my replacement iPhone 6, FedEx delivered my Joli Originals sleeve yesterday! Smooth Collection brown leather with aqua lining! It feels and smells just beautiful!! Very high quality! However, as of now its very very tight and it takes a little bit of fiddling to get your iPhone out of there, but the leather will widen a bit when you wear it in so that won't be a concern then. I highly recommmend this sleeve! So this underscores my belief that slip cases make no sense. How will you "wear" it? It will remain tight for a long while. Also, with a slip case the user has to first remove the case from pocket (now bulkier), then remove phone from case to answer a call. I have owned slip cases in the past and the same thing always happens. I don't use them because they are inconvenient. You´re absolutely right! It surely isn't the most convenient way of protection.. I used an apple leather case on my 5S paired with a sreenprotector for a year. It was great in terms of usability, but when selling the 5S and taking it out of the case a few days ago, I was a bit sad that I practically wasn't able to appreciate the actual design of the phone at all for about a year or so. That's why I decided to go for a slip case plus the naked iPhone 6 now, even if that means I have to make sacrifices in terms of usability! I actually received a phone call yesterday evening. Sure it takes some time to get used to the procedure of taking the case out of the pocket first, then taking the iPhone out of the slip case. I think it took me about 8-10 seconds to answer the call. It was ok! Not as fast than a usual case, but quite manageable. If you look at the right picture you see a little pictogram how to take the phone out of the sleeve. I think when the sleeve is worn in a bit and the leather becomes a bit more flexible, this method will help a lot! I'll have to wait and see! At least I knew what to expect before ordering, so I'm quite happy with it!! I've gone with sleeves or slip cases for most of my iPhone's in the past. This time however I wanted to but haven't because I can't see my self using the 6 Plus without a case on it. The iPhone 6 Plus is too big and slippery to handle on it's own. I used a wallet with my 5S but I've decided not to with the new phone as wallet cases are cumbersome to use with and add more bulk to an already large phone. The only option I have is a case that goes on the back like the Spigen ones.